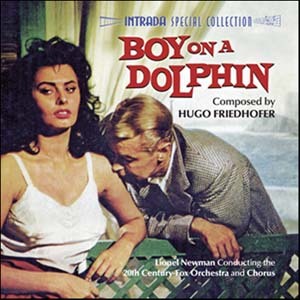 The twenty-ninth Soundtrack of the Week is Intrada's release of Boy on a Dolphin, scored by Hugo Friedhofer. This is some of my favorite "underwater" music, right up there with Bernard Herrmann's Beneath the Twelve Mile Reef, John Barry's Thunderball and Saint-Saëns' "The Aquarium" from "Carnival of the Animals". There are also several beautiful cues written in a Greek style, similar to klezmer and Middle Eastern music. Boy on a Dolphin is perhaps distinguished by being one of the first movies — maybe the first? — in which the female lead walks in a specially dug trench so she won't tower over her shorter male co-star. The leads are Sophia Loren and Alan Ladd here, but I remember hearing the same story about The Blue Lagoon with Brooke Shields and some guy.